“Where did the time go?” asks Julian Ramil, and as they both shake their heads his wife Claudia repeats: “Yes, where did the time go?” We were talking about El V, one of the best-known milongas in San Francisco and beyond, and which was about to celebrate its 20th anniversary on May 30th at the very same venue where it started in 1996. However, at the time when I was talking to the Ramils in early April, El V was about to close its doors forever. It looked like the much anticipated 20th anniversary celebration was not going to happen. The proprietor of El Valenciano, the restaurant/bar/dance club which had served as the venue of this popular tango social, had decided to sell the business. The Ramils had received notice about the termination of their lease, that very afternoon of the last milonga. This meant they had to break the news to both the local and the wider tango community — and find a new venue quickly. 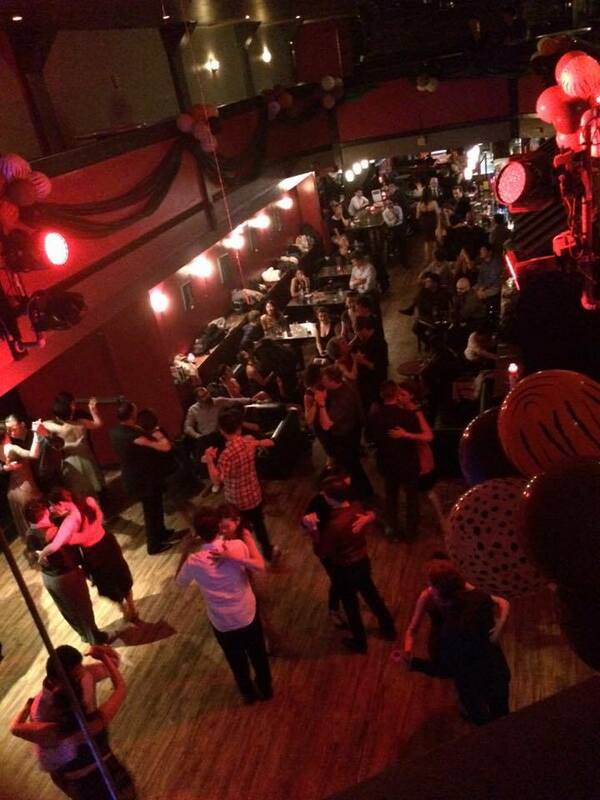 The beloved Tuesday night milonga, “El V”. “It didn’t exactly come as a surprise,” said the Ramils, who founded the El V milonga in 1996, and who had been hosting it ever since. The building is located at a prime location in San Francisco’s Mission neighborhood. Since real estate prices have been skyrocketing for a number of years, driving less-than-above-average income residents together with smaller dance and music events out of this part of town, the Ramils suspected that their Tuesday night milonga – one of the longest-running Argentine tango events in the Bay Area – would sooner or later come to an end. It was only a matter of time before the restaurant/bar would be put on the market for sale, and force them to look for a new venue, thus becoming yet another victim of gentrification. 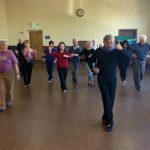 Many popular tango and dance venues, such as Studio 1924 in Oakland, and numerous other ballroom dance studios in the Bay Area, had suffered the same fate in recent years. There had been some previous issues: since the passing away of the previous owner a few years ago and the subsequent taking over of the business by another owner (his ex-wife), the venue had not been running as smoothly as patrons had been accustomed to. 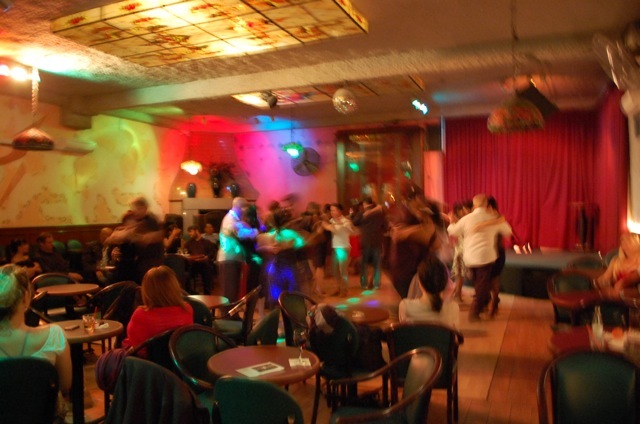 Neither the dance club, which also hosted salsa and swing events on a regular basis, nor the bar could obtain a liquor license without the operation of the restaurant. So in order for the dance club and the bar to remain open for dance events late at night, the restaurant had to remain open, too. 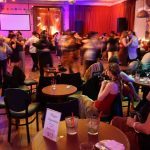 However, the tango dancers who came for the Tuesday night milonga were not so much interested in having a meal as simply enjoying a drink while focusing on having a good time dancing. 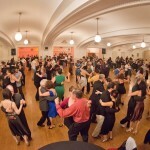 Consequently, the tango crowd didn’t generate enough income for the business – a common problem with tango events that take place at restaurants or bars. During my last visit to El Valenciano in the winter, I couldn’t help but notice that the restaurant had lost much of its appeal. The once popular authentic Spanish eatery with its Moorish-style alcoves and colorful murals had long been known for its delicious food and warm hospitality. Now it looked like it was due for a much needed make-over. Nevertheless, the Tuesday night El V milonga in the classy backroom remained as lively as ever. It was still a very popular spot where one could always encounter a particularly large number of professional and other high-level tango dancers. It was still on the ‘A-list’ for visiting Argentine tango dancers from all over the world as it had been for many years. Not surprisingly, I often found myself being asked about El V in San Francisco by dancers in far-away places such as rural New York State as well as cosmopolitan Barcelona – a phenomenon that was not expected in its humble beginnings. “It really started just as an after-party of Verdi Club in 1996”, recalls Julian Ramil. When San Francisco became the residence of the cast of Forever Tango, people often hosted private tango events at their homes. 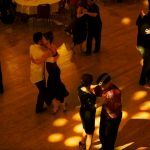 Verdi Club, Ruvano’s and Broadway Studios were pretty much the only public places in San Francisco to dance tango. El Valenciano in those days was popular with the salsa and swing crowd. It featured a stage and a small dance floor surrounded by a semi-circle of tables and club chairs. When Julian started to hang out with a small group of tango dancers after Thursday night’s milonga at Verdi Club, he tried playing some tango tunes. 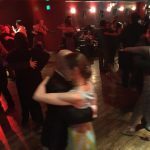 Since the small tango community liked it and would ask for more, he decided to start a small milonga on Tuesday nights. Inspired by one of his favorite milongas in Buenos Aires at the time, the Almagro, Julian wanted to create a small, intimate place with a pleasant crowd and no security. He succeeded and named his new milonga Ramilonga Del Valenciano. It became the home of a tight community, “…a place where the die-hards would hang out,” he says. Somehow over time people started to refer to it as El Valenciano, then eventually El V, and that’s how it eventually became known. The setting was certainly part of the success, but so was the music. For the first five years, Julian was the only DJ playing the tunes every Tuesday night. “I love the music and I want to share it,” he explains. Only slowly would he start to approach the idea that perhaps every now and then he needed a break and needed someone to fill in for him. That’s when he asked Glenn Corteza to take turns. Glenn playing the music was an equal success with the dancers. Over time they asked other tango DJs for whom they had high regard, and so Felipe Martinez, Christopher Nassopoulos, Rina Gendelman, and Shorey Myers also became regulars at El V.
In 2003, the popular milonga had to close its doors for a short while. But within less than a year, El V was back. 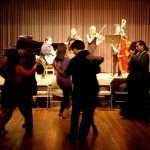 By now the Argentine tango fever had spread widely, and the Bay Area tango community had grown to a substantial size. 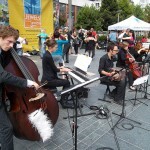 At the same time, the first local Argentine tango orchestras were founded and started to perform. 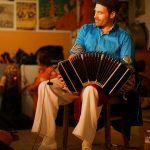 Julian, a bandoneonist himself, decided it was time to take advantage of the small stage in El Valenciano’s backroom, and he invited the newly formed local orchestra, The San Francisco Tango Orchestra directed by Roman Rosso to play. In later years local orchestras such as Trio Garufa, Pablo Motta, and Seth Asarnow with his Sexteto Tipico all performed at El V, to the delight of the tango crowd. Both Julian and Claudia Ramil, being full-time professional teachers and performers, managed to keep El V on the cutting edge of Argentine tango during all those years. “It was like going to an art event,” as they described it. When they had to leave the beloved venue, and the tango community fell into mourning over the loss of the place, the Ramils seemed to be the only ones who didn’t appear distraught. They had already been looking ahead, well-prepared for a change. Within days of the announcement that this time El V was closing its doors for good, they had signed a new lease with Balançoire Restaurant and Club on Mission Street, only a few blocks from the old venue. Seamlessly, they opened their new milonga at a bigger, newer venue. Their loyal tango community followed without missing a beat. 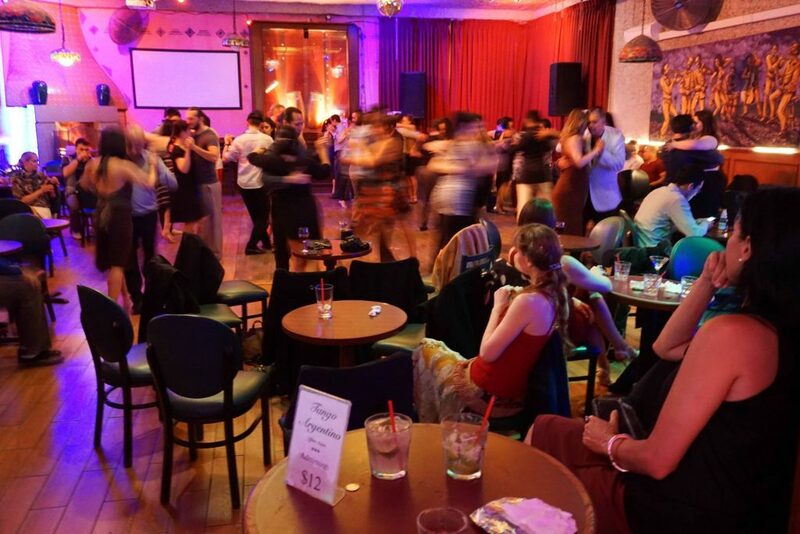 For a few weeks now the Tuesday night tango crowd can be found on 2565 Mission Street, and that’s where El V’s 20th anniversary will take place – but now under the name Ramilonga Balançoire. 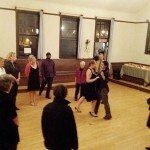 TANGO BAILONGO w/ TWO DANCE FLOORS! Many thanks to Andrea Bindereif of Andrea’s Tango Blog for submitting this story.